Changing schools is never easy, but Charles is having an especially tough time. He left behind his friends in West Virginia when his family moved to Ohio. He doesn’t know how to play baseball. He’s small for his age. And the school bullies are picking on him. But then he finds a music store like none other——one with mysterious helpers who introduce him to the banjo, its history, and its many playing styles. He learns about the instrument and, in the process, discovers a bit about himself and life. Vida Brenner has created a lovely story for young readers about a fourth grader coming to terms with a difficult move and a difficult instrument. The book will also interest anyone who enjoys music or who remembers what it’s like to learn an instrument. Brenner, of Iowa City, is a former English teacher and journalist, who plays the banjo and classical guitar. 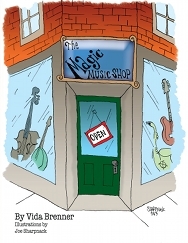 The Magic Music Shop includes charming illustrations by Joe Sharpnack, an Iowa City-based editorial cartoonist, writer, illustrator, and musician.